Colorverse Multiverse Season 3 includes “sets” of inks, with one 65ml bottle of one ink and a 15ml bottle of another ink. This set includes a 65ml bottle of String and a 15ml bottle of Brane, a glistening ink. Samples of these sets can be very hard to come by since the bottles are different sizes. I purchased my samples from Vanness Pens. String is a honey gold, and Brane is a medium green. String has some crazy shading in large swabs, ranging from a medium yellow to dark red and even some green. In ink drops String has not dried, even after six days. It shows the same shading as in large swabs. Brane shows a bluish-back sheen. Brane is supposed to be a glistening ink (has shimmer in it) but there are so few shimmer particles that I didn’t notice them unless I was looking hard. There are so few that I don’t even know what color they are supposed to be. Other properties: high shading, no sheen/tiny sheen, and no shimmer/tiny bit of shimmer. The shimmer is very very sparse. Ink swabs for comparison, left to right (top to bottom for mobile RSS): KWZ Old Gold, Colorverse 25 String, and Robert Oster Gold Antiqua. Click here to see the Colorverse inks together, and here to see the yellow inks together. Sailor Jentle Waka-uguisu, Colorverse 26 Brane, and Robert Oster Jade. Click here to see the green inks together. 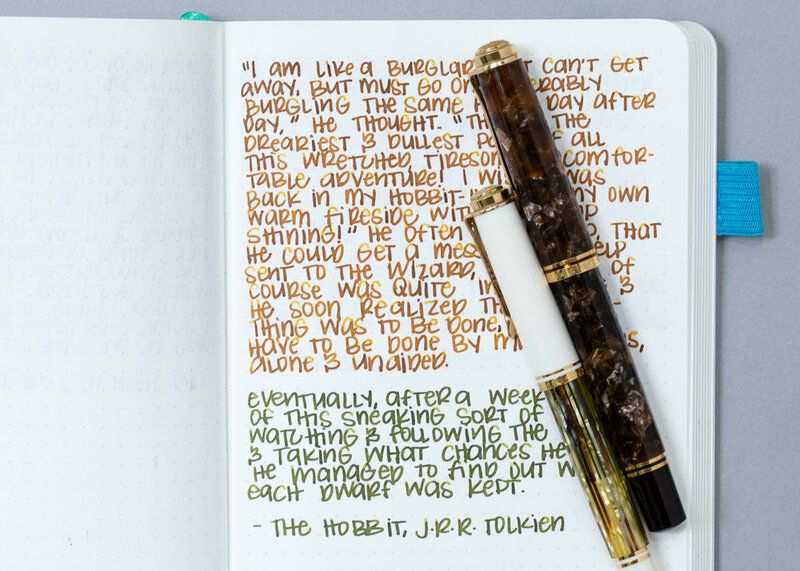 I used a medium Pelikan M800 Renaissance Brown and a medium Pelikan M400 White Tortoise on an ivory Hippo Noto Notebook. The inks had an average flow. Overall, both inks behave well and have some really great shading. I love the color of String, but both are great for fall. Brane didn’t have much shimmer in it, I was expecting a lot more shimmer than I got. Disclaimer: I purchased these inks myself, and all photos and opinions are my own. This page does not contain affiliate links, and is not sponsored in any way.